Each week, Blue Cliff Zen Center facilitates four meditation practice sessions for our local community. In keeping with the tradition of Dana*, there is no charge for this service; we rely solely on freely given donations. The offerings received in our donation plate, while greatly appreciated and needed, only cover a portion of the Zen Center’s operating costs. As a 501(c)(3) non-profit organization, Blue Cliff Zen Center requires dedicated sponsorship. 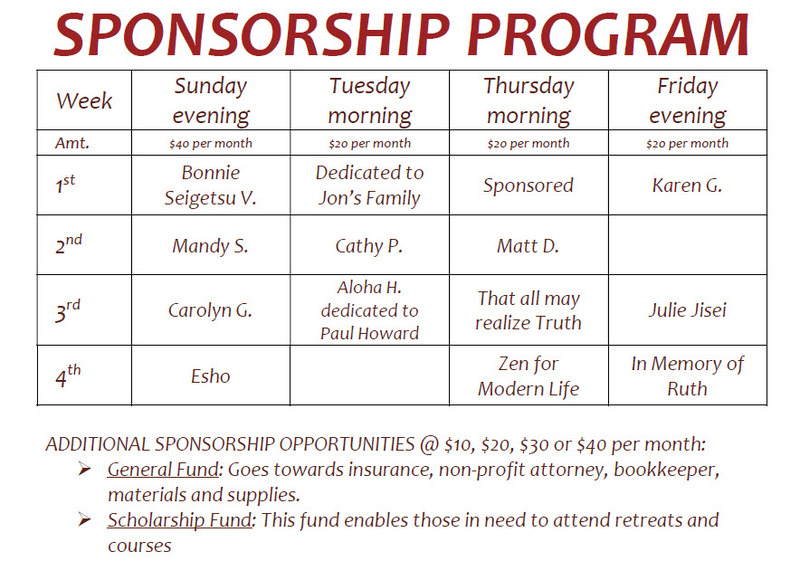 If you feel benefitted by your association with Blue Cliff Zen Center, please consider becoming a sponsor. By making a small monthly tax-deductible contribution ($40 for Sundays, $20 for the weekday sessions), you can make a meditation session possible. Even if you are unable to attend the session that you sponsor, your gift will allow this important work to go on. You’ll not only greatly benefit others, you will benefit greatly by giving this precious gift. You may dedicate the session you sponsor to the memory of a loved one or to a cause that is meaningful to you. You may also team up with friends and sponsor a session together. We are asking for a six month to one year commitment, if you can. This steady support will nourish Blue Cliff Zen Center, our mission and our community. Each week, Blue Cliff Zen Center facilitates four meditation practice sessions for our local community. Check the calendar at the bottom of this page for open non-sponsored days and other sponsorship categories and email bluecliffzen@gmail.com to let us know which day/category you’d like to sponsor (for example “2nd Tuesday of each month” or “bookkeeper”). You may also team up with a friend and sponsor something together. Choose which meditation session you would like to sponsor in the drop-down payment menu. If you are sponsoring something else (like “bookkeeper”) please still use the amount associated with a meditation session, and email us what it is you’d like to contribute towards. Your name (or “anonymous”) will go below next to that sponsorship category. This steady support will nourish Blue Cliff Zen Center, our mission and our community. You will be directed to the PayPal website and walked through setting up a simple monthly contribution. You can cancel at any time. Clicking subscribe will take you to the secure PayPal website where you’ll complete the payment process. If you’d simply like to make a one-time donation. Please click the button to the right. Clicking donate will take you to the secure PayPal website. *By giving freely of our time, knowledge, and resources for the benefit of others, we awaken through the act of generosity. This fundamental Buddhist practice, known as Dana, is at the core of our practice. Without the gift of alms, our teacher would be unable to share with us the Dharma and we would be unable to practice at our Zen center together. Your generosity is both greatly appreciated and a vital aspect of our tradition. Our calendar is maintained by Blue Cliff Zen Center. Your name will appear once you’ve completed step 1 and step 2! Thanks so much.